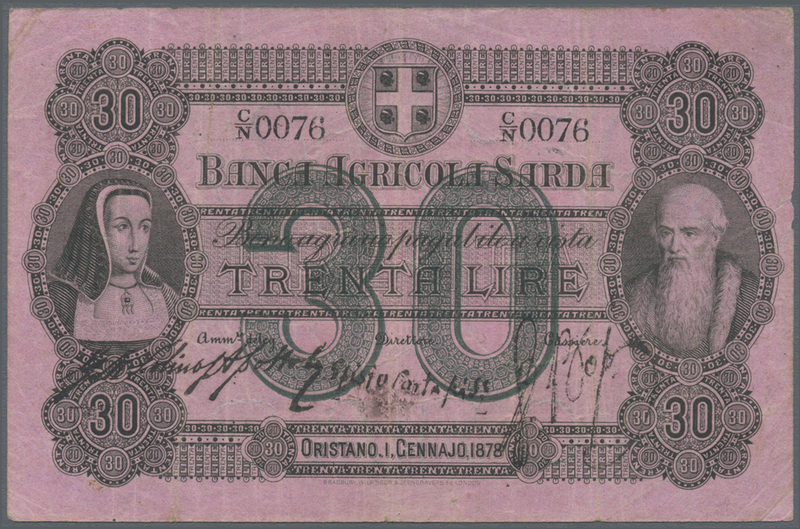 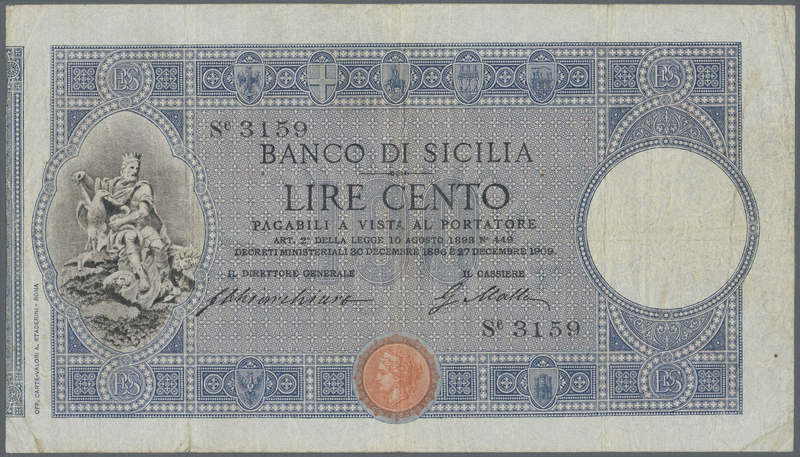 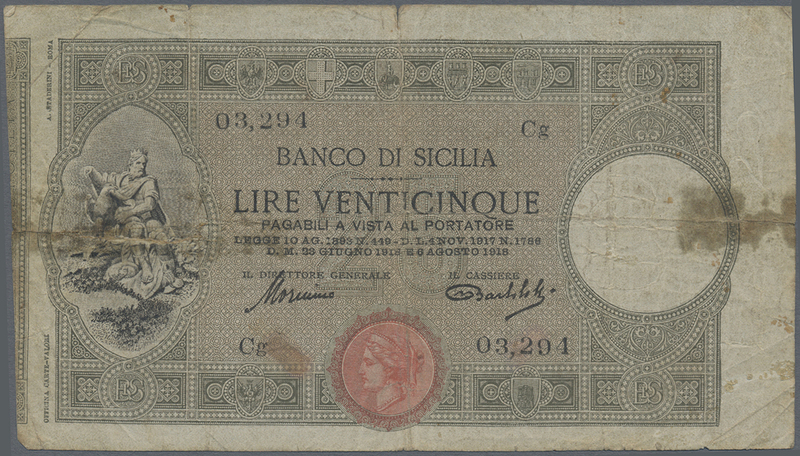 1910 Pick S895 25 Lire 1918 "Banco di Sicilia" P. S895, stronger used with strong folds, stains, and 2 taped tears, still complete and nice collectible, condition: VG. 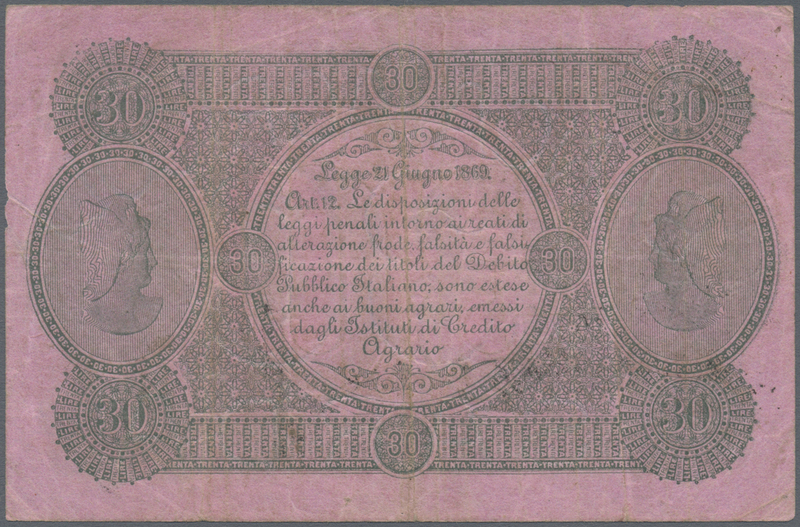 1911 Pick S897 Banco Di Sicilia 100 Lire 1909 P. S897, used with folds, several folds and creases in paper, pinholes at left, minor border tears, still nice colors, condition: F to F+. 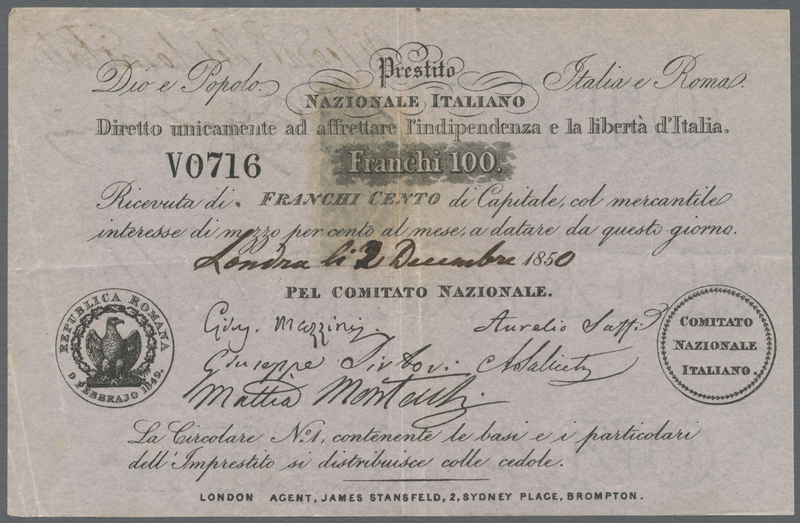 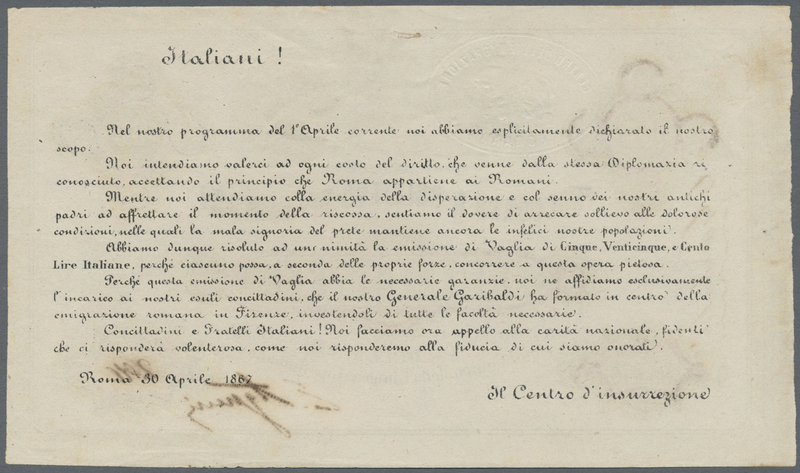 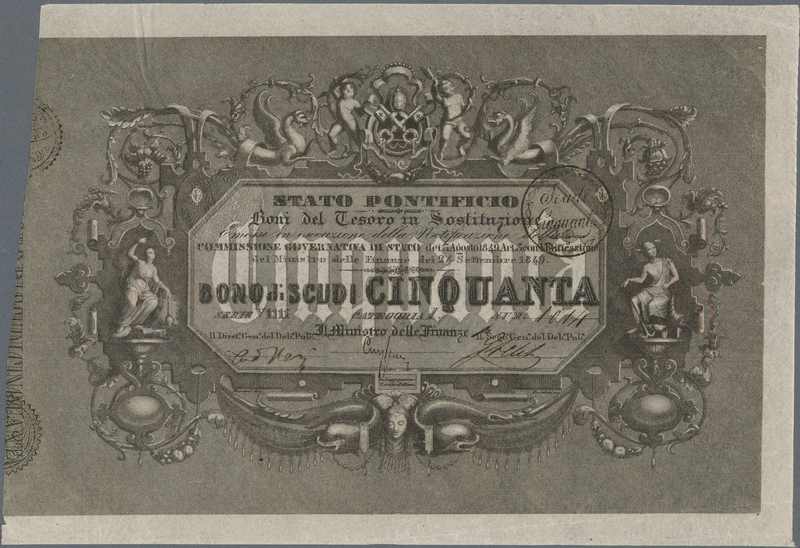 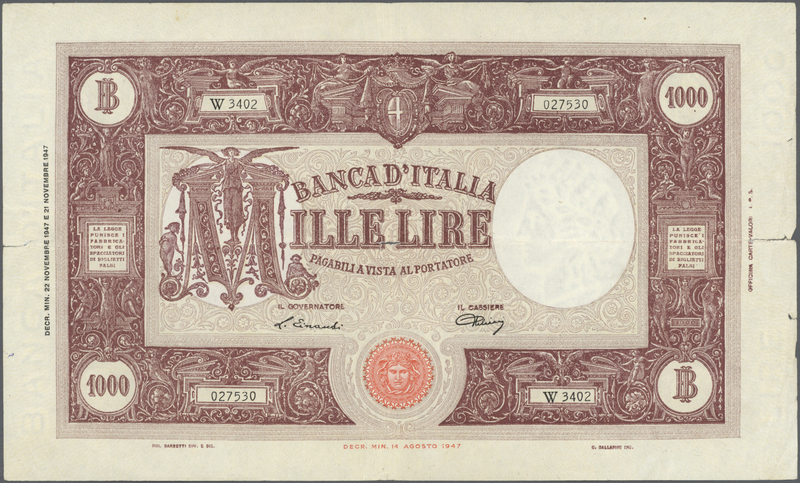 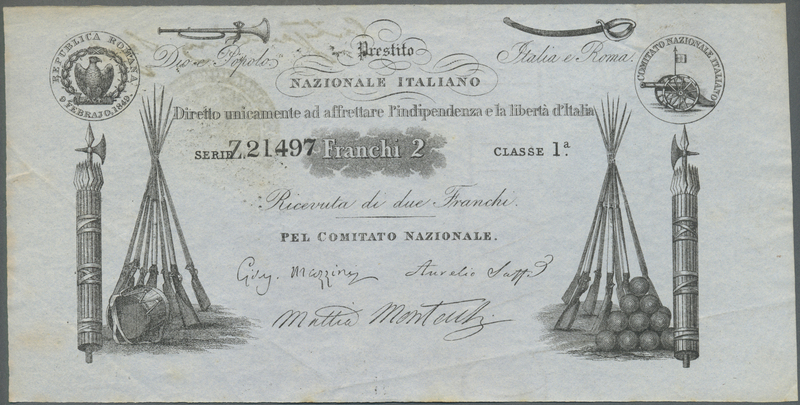 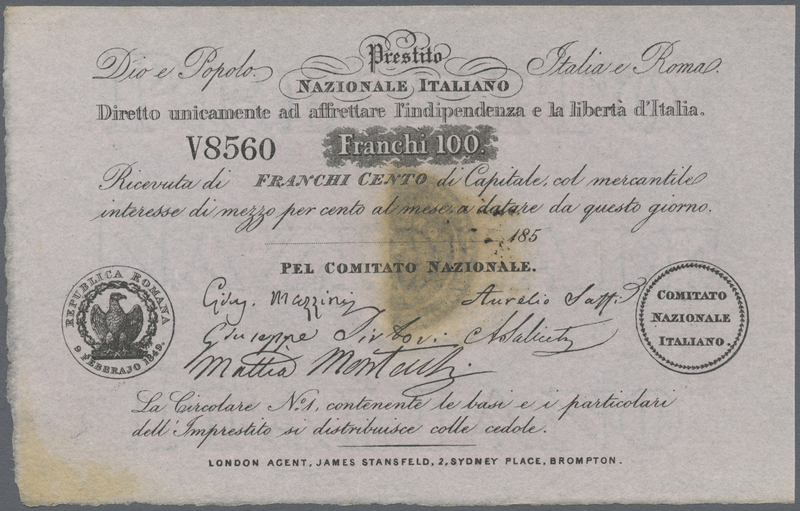 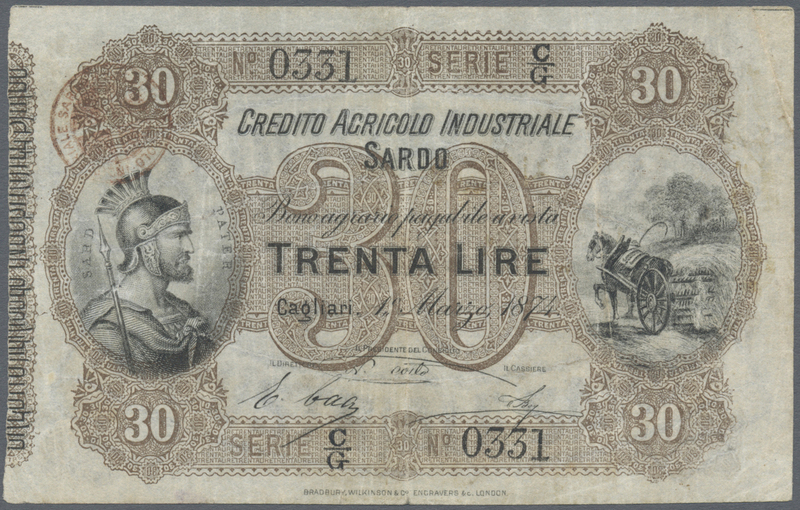 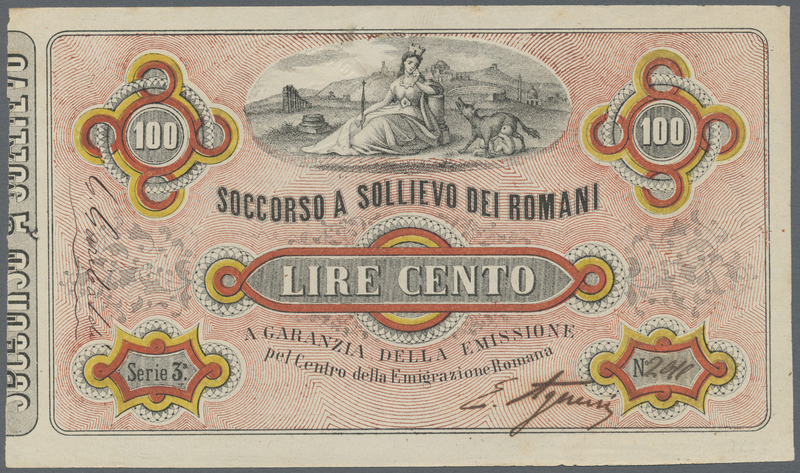 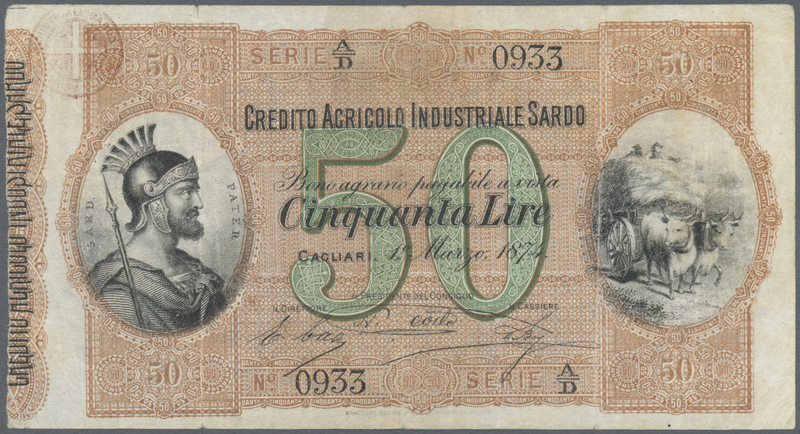 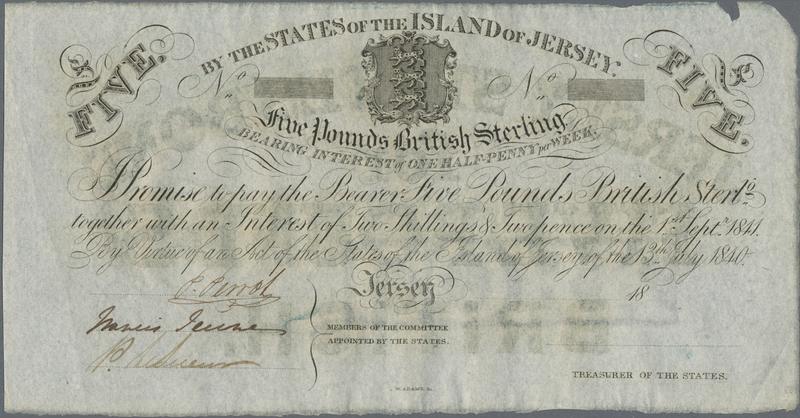 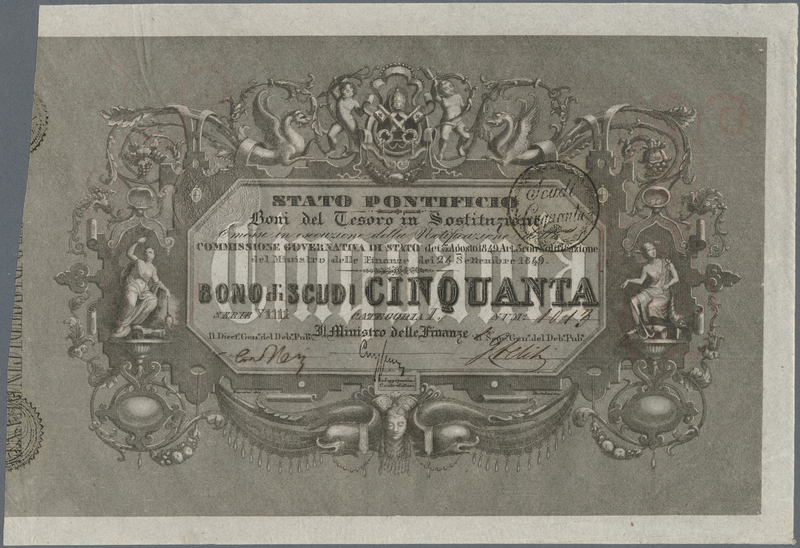 1913 Pick S927 Credito Agricolo Industiale Sardo 50 lire 1874 P. S927, used with 3 strong vertical folds, center hole, pressed but still strongness in paper and nice colors, no repairs, condition: pressed F, optically appears VF. 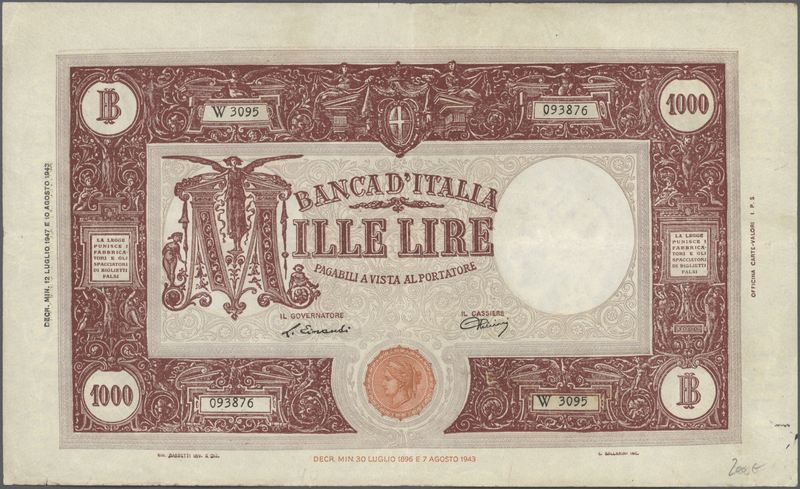 1920 NL rare assignat "Il Banco Di Roma" 50 Lire 1944 with watermark on security paper, light folds in paper but no holes or tears, nice colors, condition: F+ to VF-. 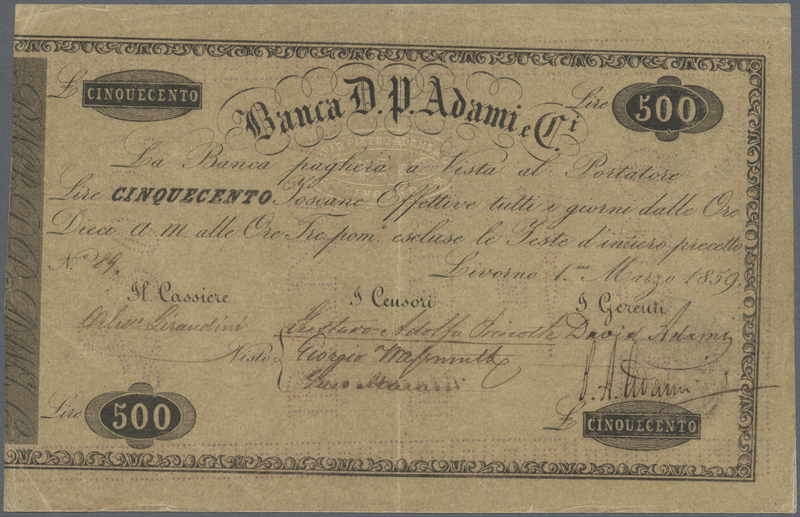 1924 NL Banca D. P. Adami, 500 Lire 1859 P. NL, very rare and seldom seen note, used with center fold and handling in paper, no holes or tears, very strong paper with crispness, condition: VF to VF+. 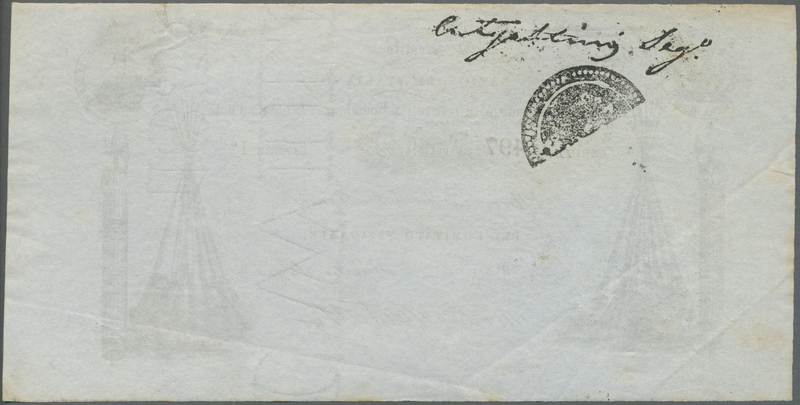 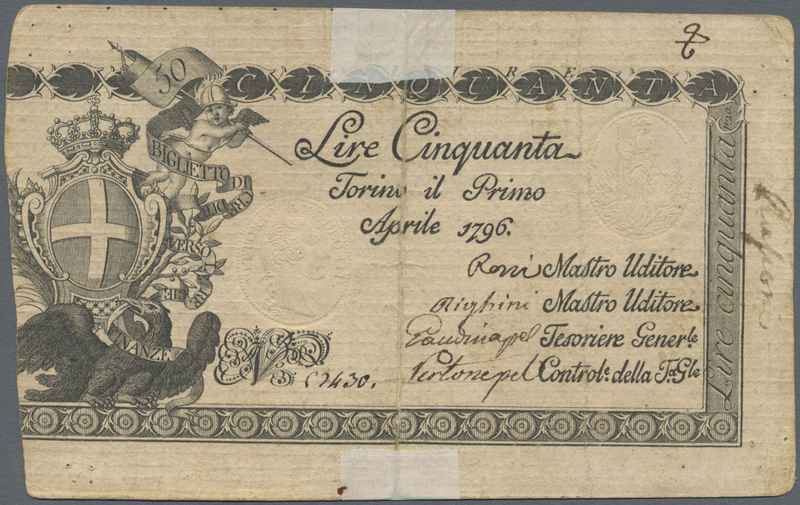 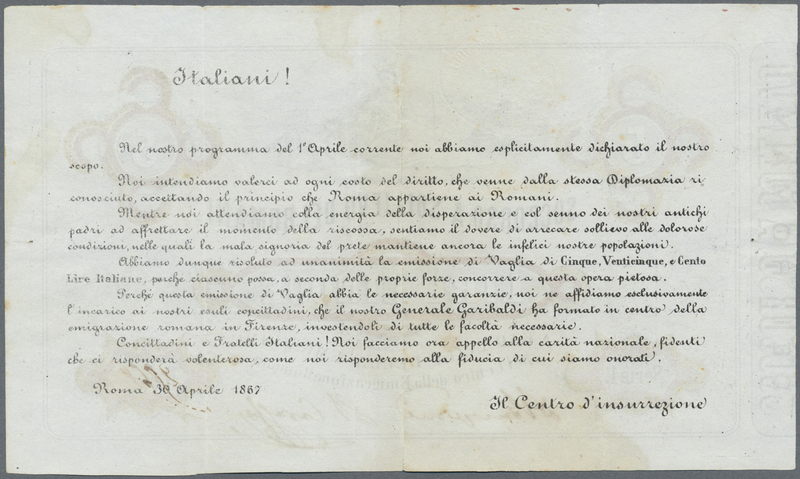 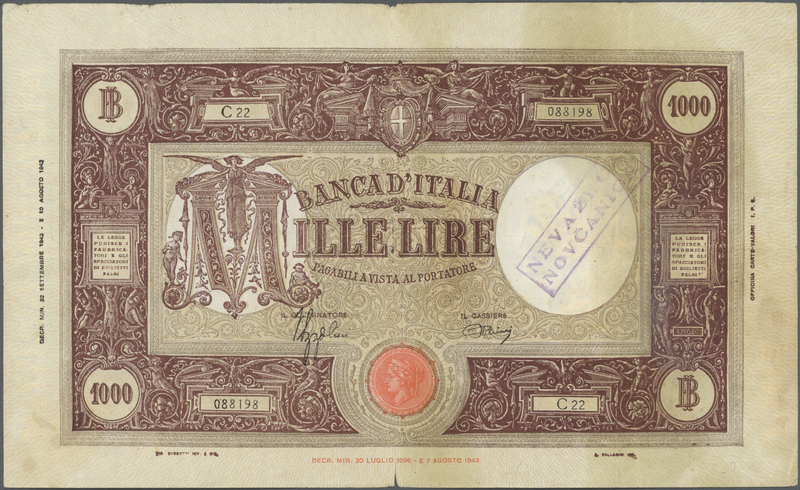 1925 Pick NL Torino il Primo 50 Lire 1796 P. NL, used with folds and pinholes, strong center fold fixed with tape on back, strongness in paper, small ink writing at right, condition: F- to F.
1926 Pick NL Rare "Prestito Nazionale Italiano" 100 Franchi 185x remainder P. NL, half stamp on back, light stain at lower left, unfolded, crisp original paper, no holes or tears, condition: aUNC. 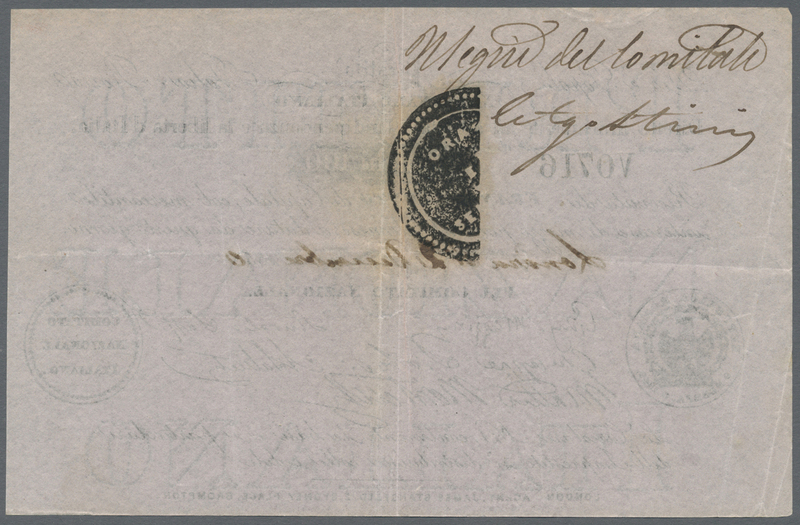 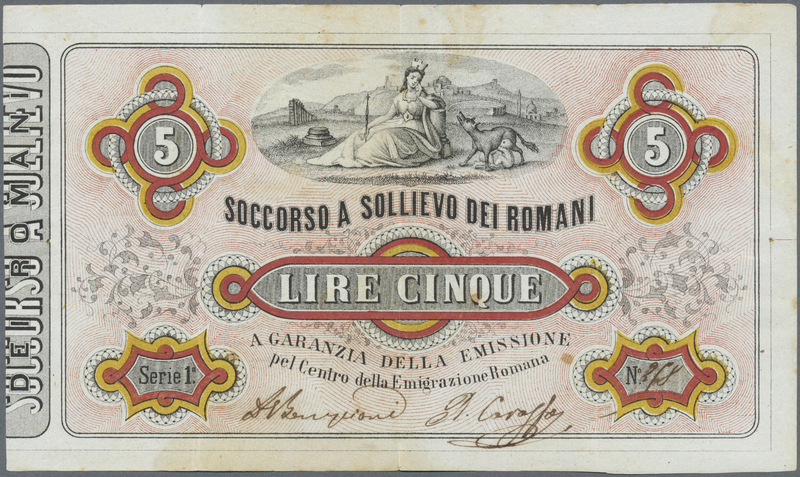 1927 Pick NL 5 Lire Soccorso A Sollievo Dei Romani 1867 P. NL, used with vertical and horizontal folds, minor border tears, no holes, still nice colors and strong paper, conditoin: VF. 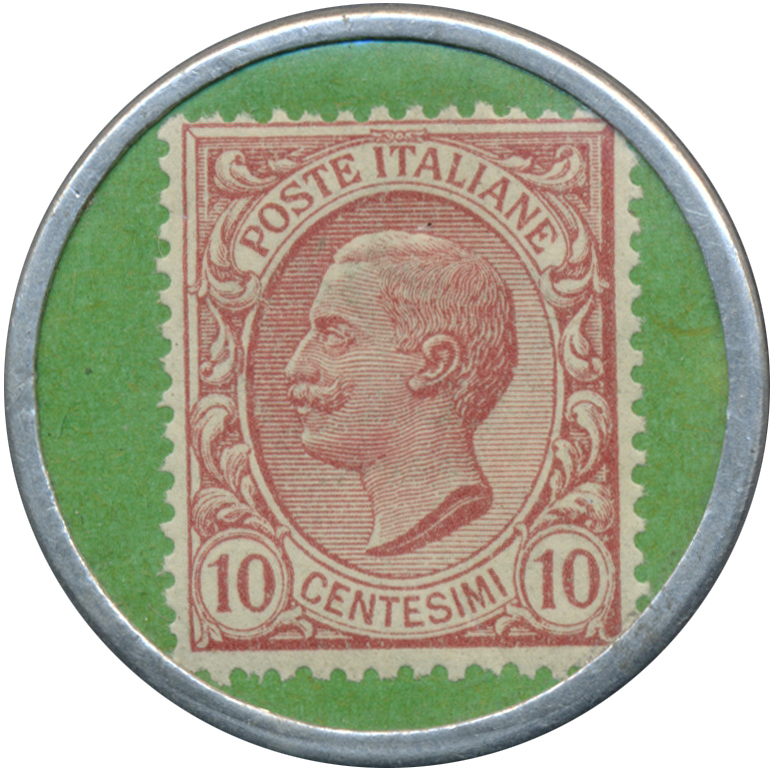 1928 Pick NL P.O.W. 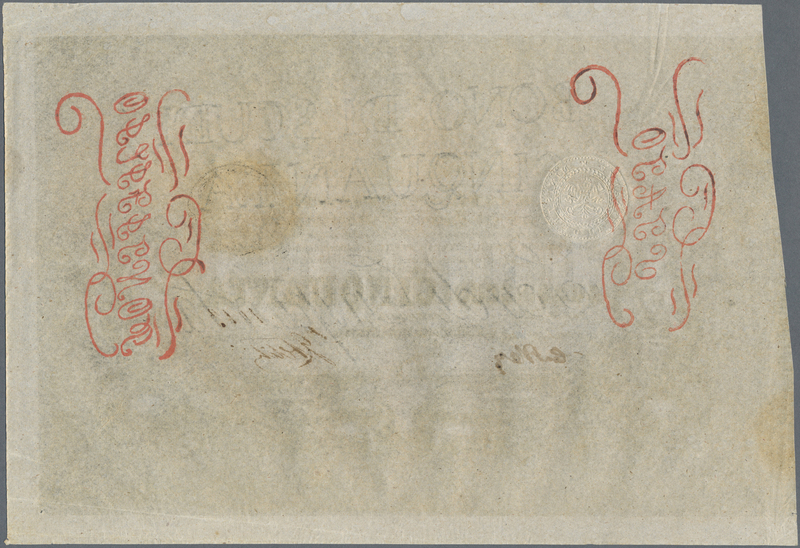 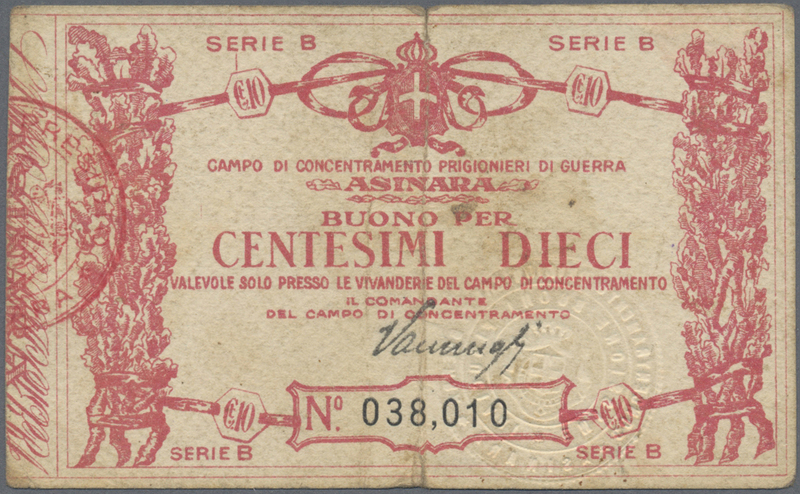 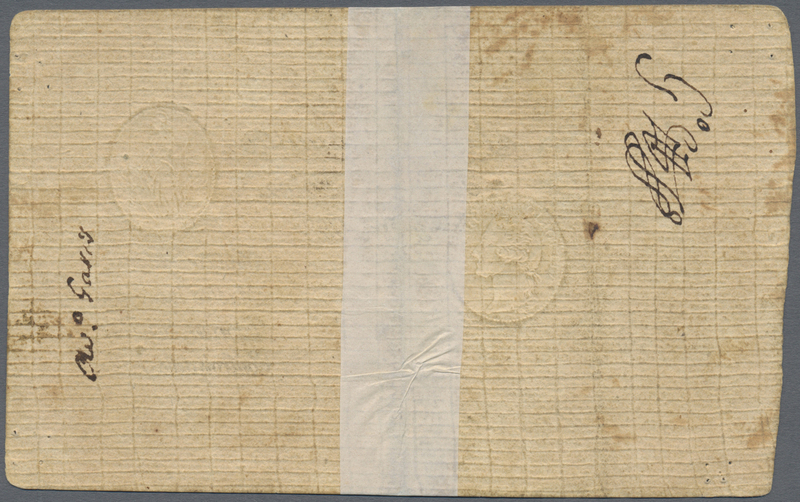 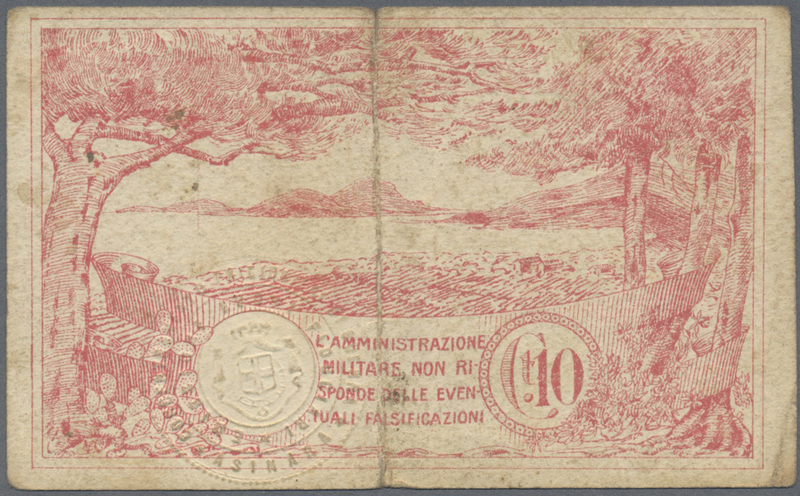 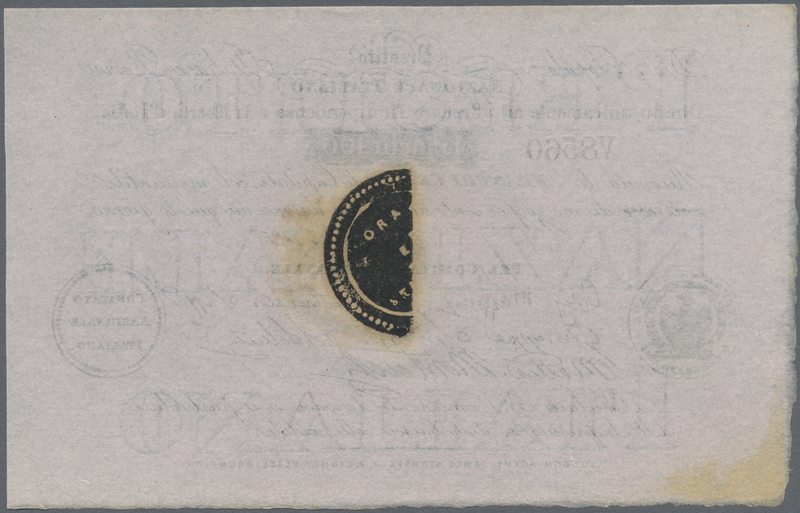 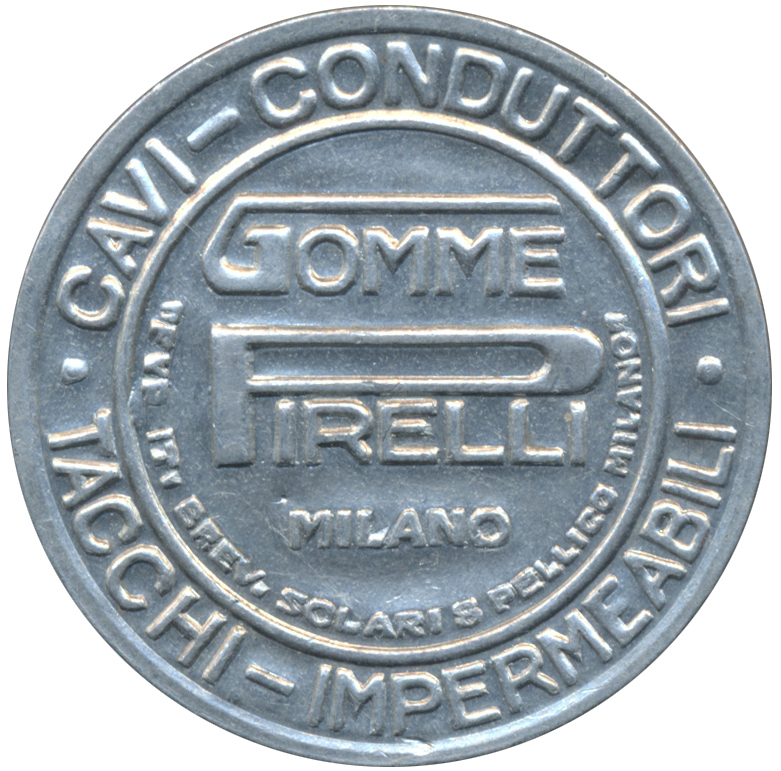 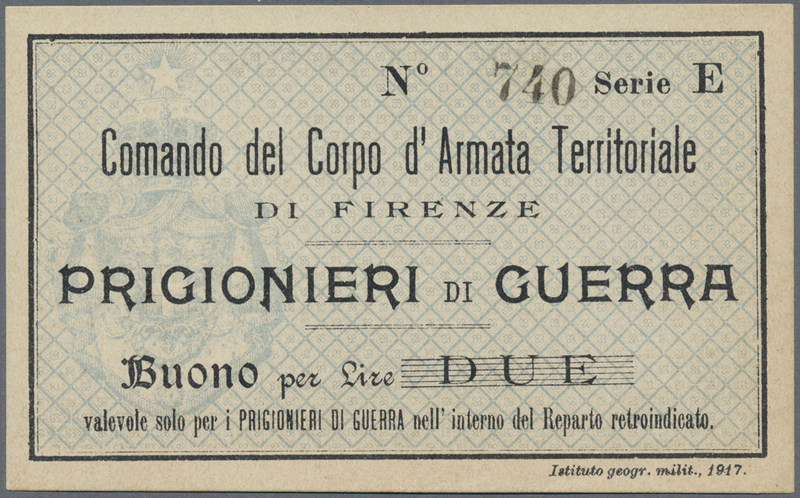 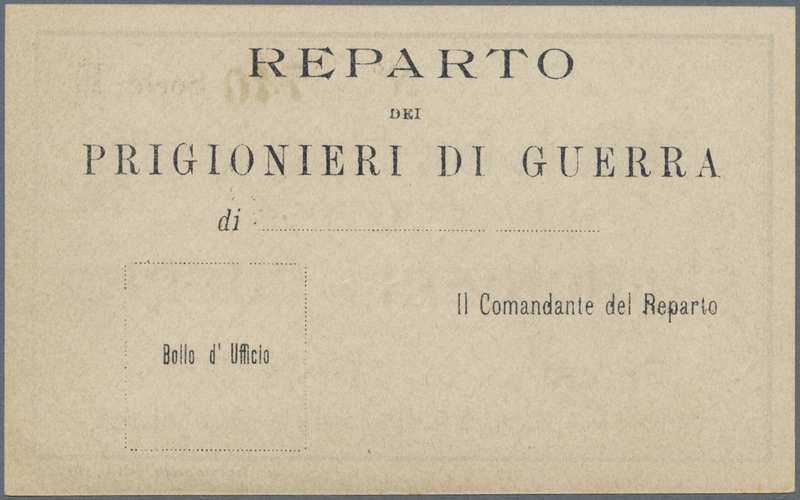 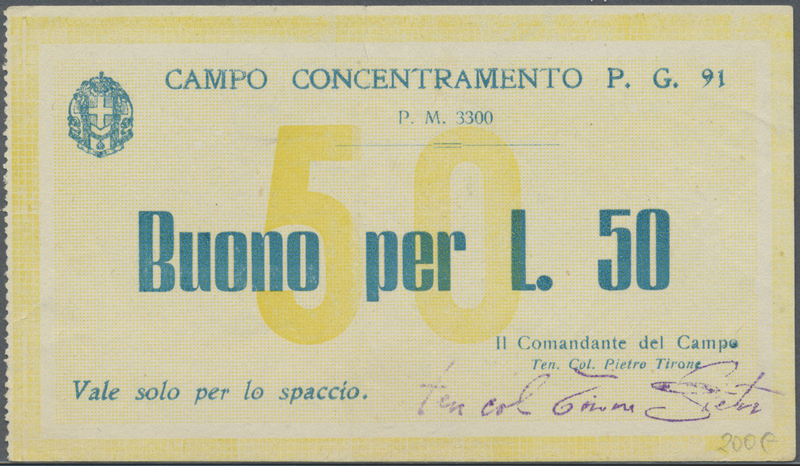 money "Comando del Corpo d'Armata Territoriale" 2 Lire 1917 P. NL, remainder with light handling in paper, condition: aUNC. 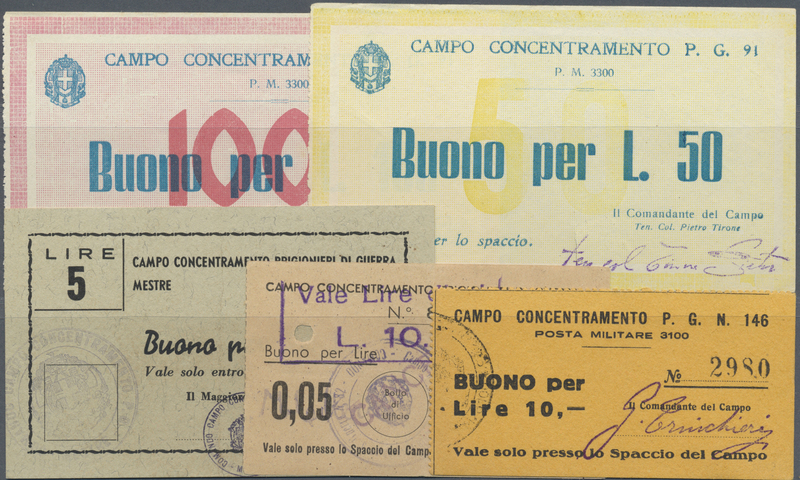 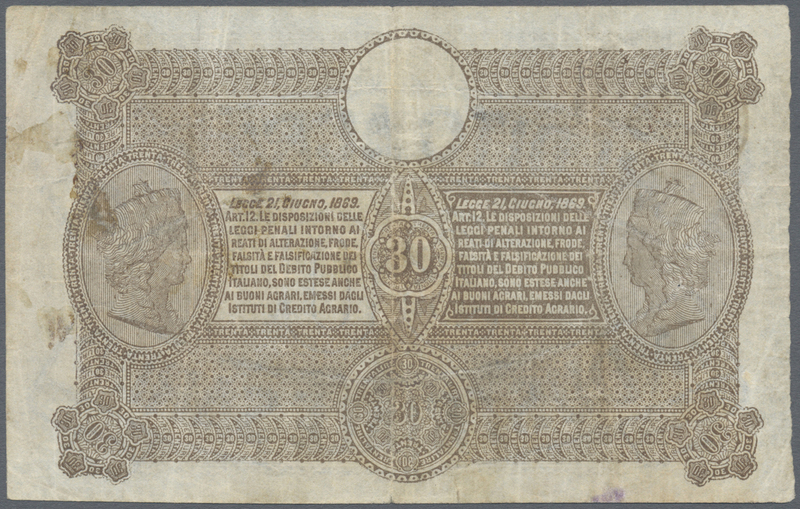 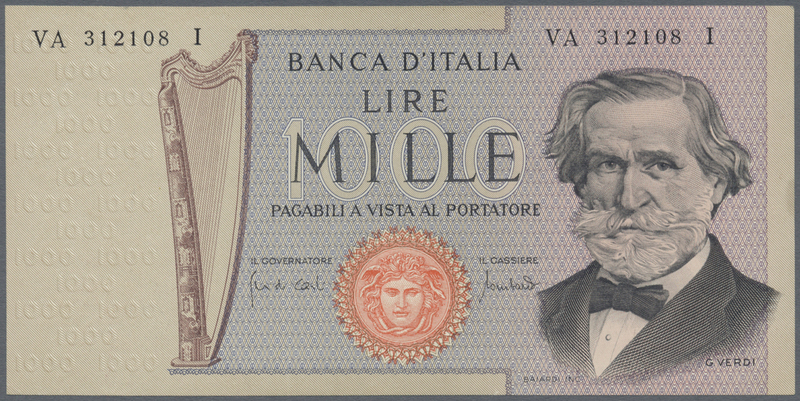 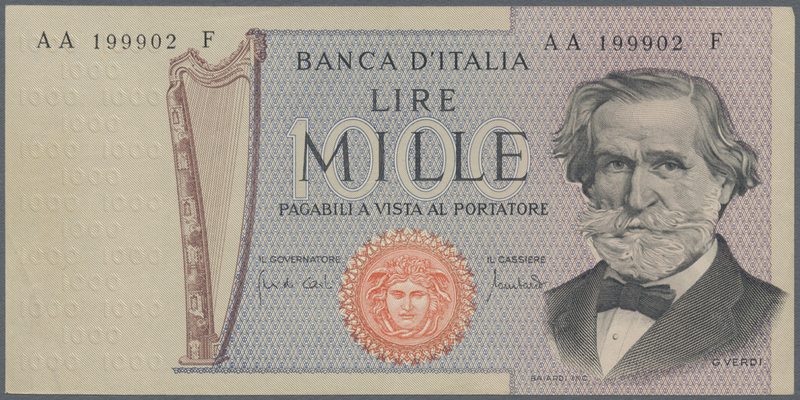 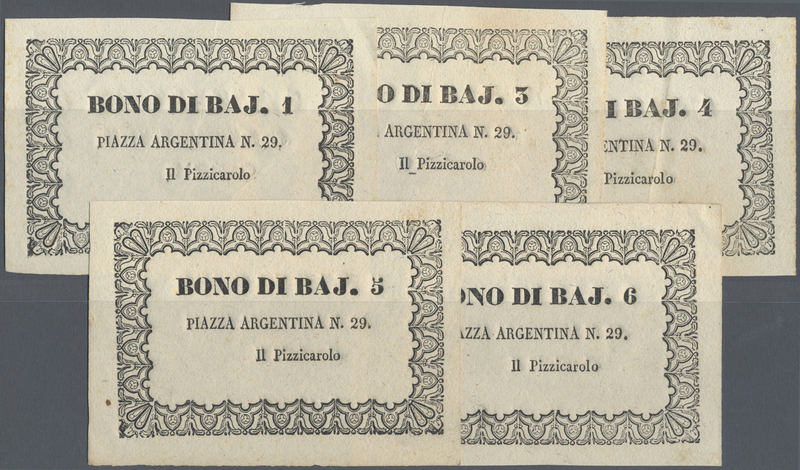 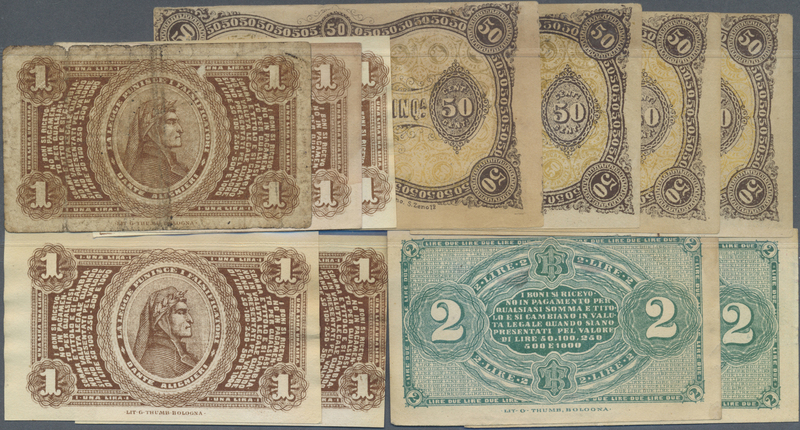 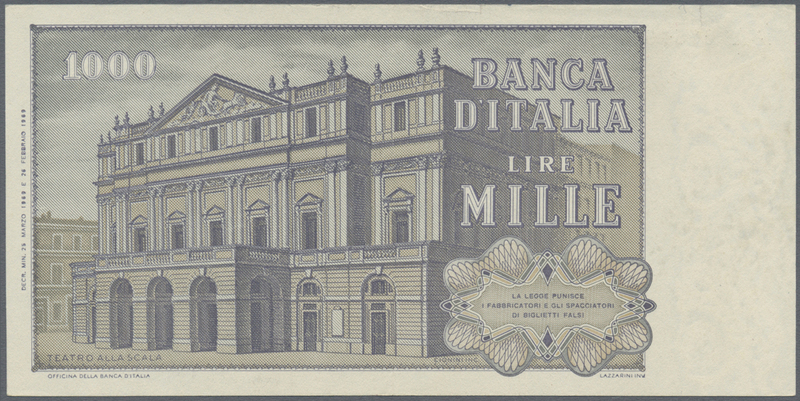 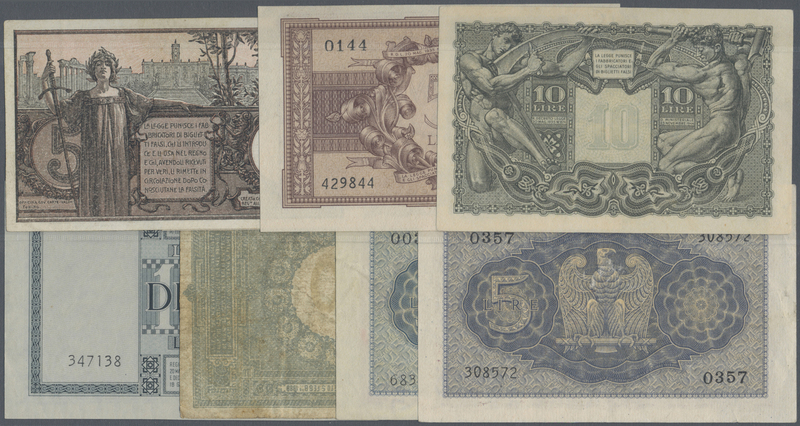 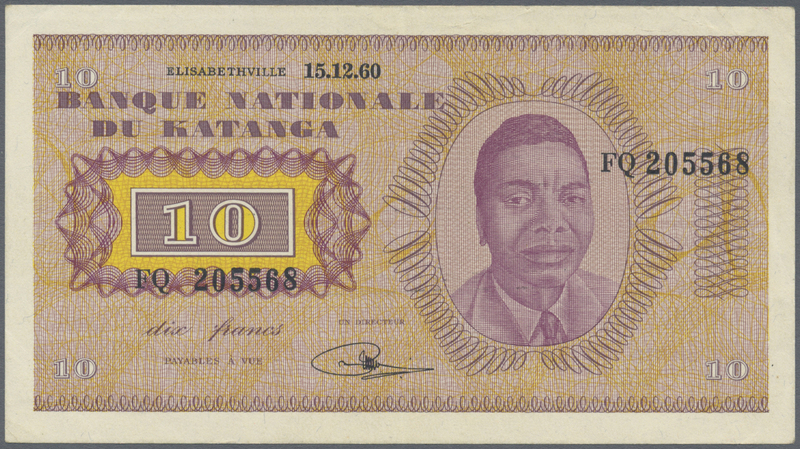 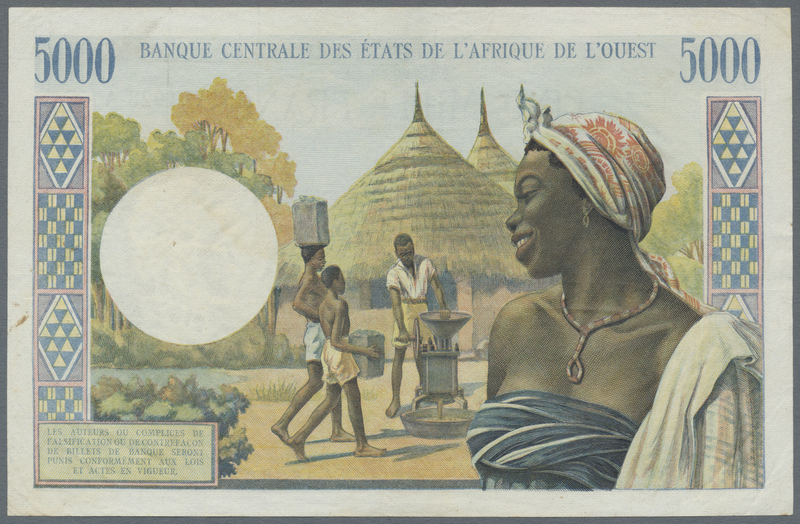 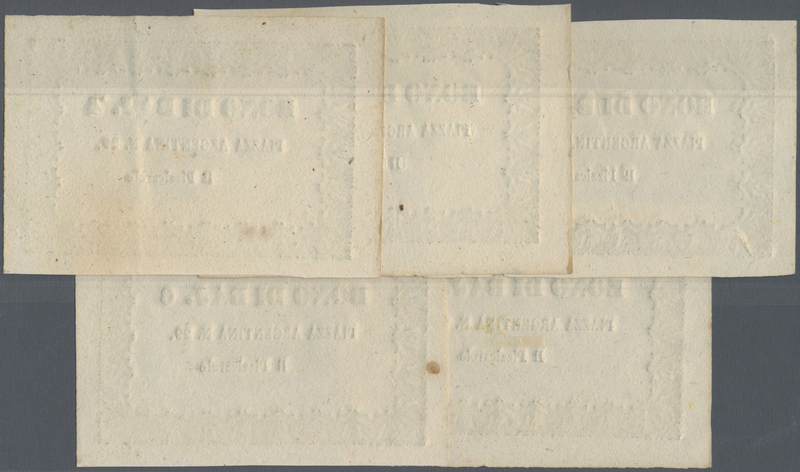 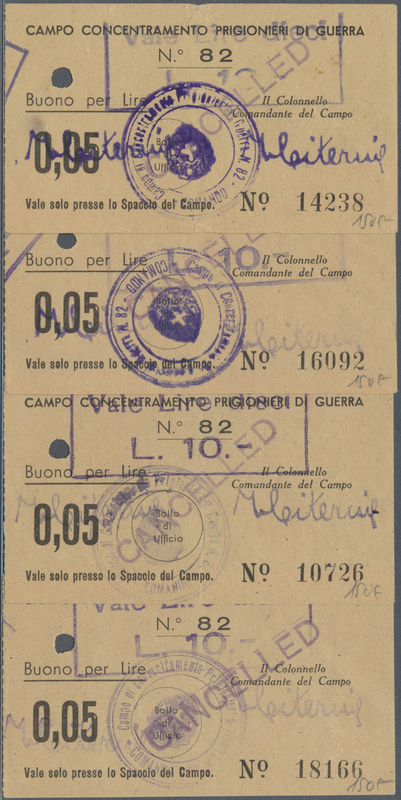 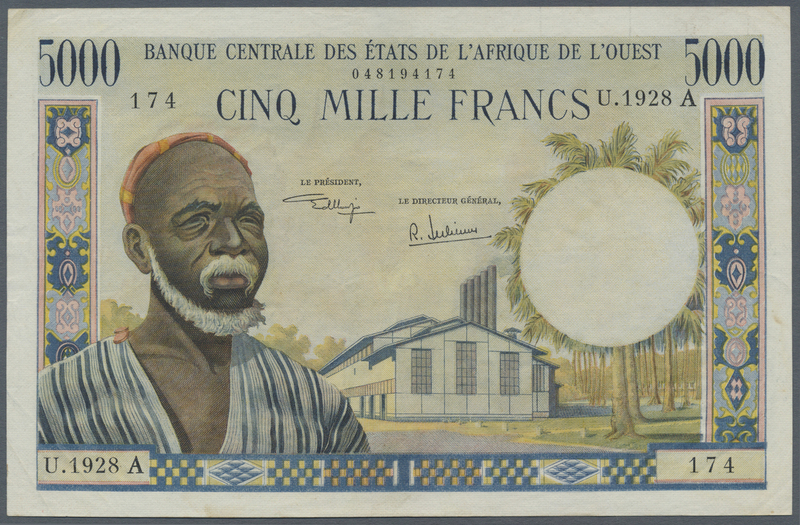 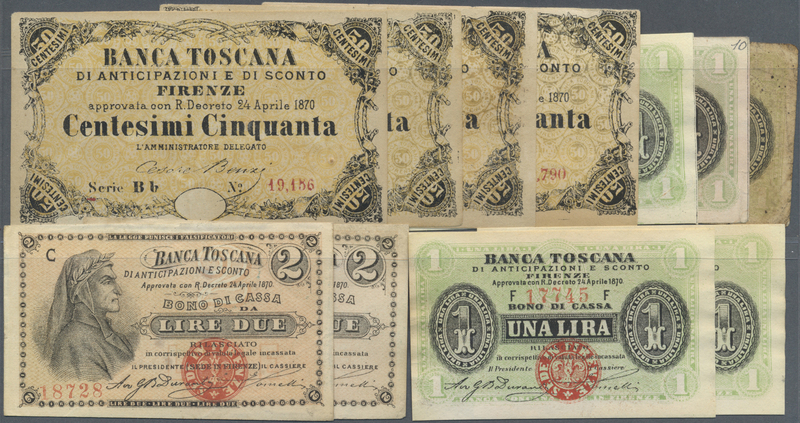 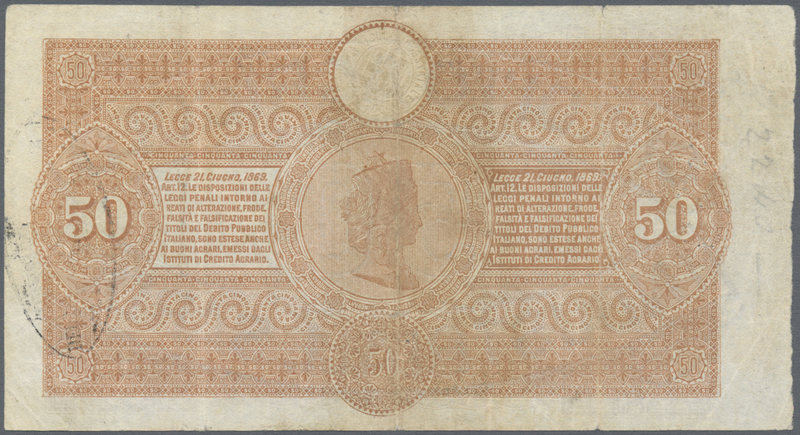 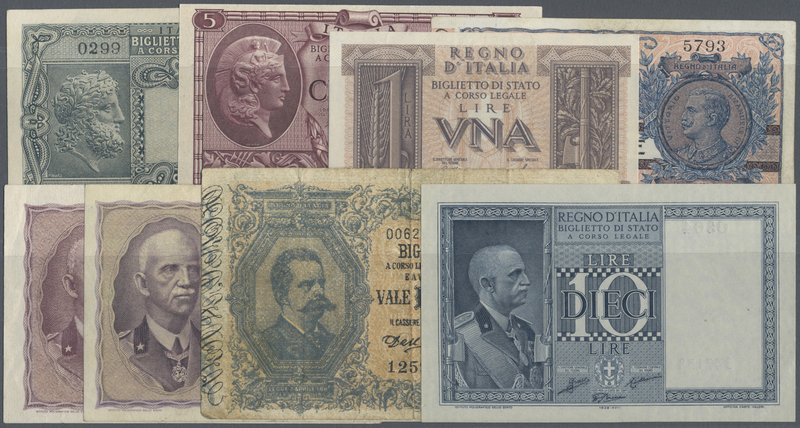 1930 Pick NL, similar to sample print of "Marca Da Bollo" issues from 15 Centesimi to 15 Lire, all overprinted "Saggio" (Sample), issued by the Ministry of Finance, printed on banknote-like paper which is cut at upper border but not into the design of the bons, nice collectible item, condition: VF. 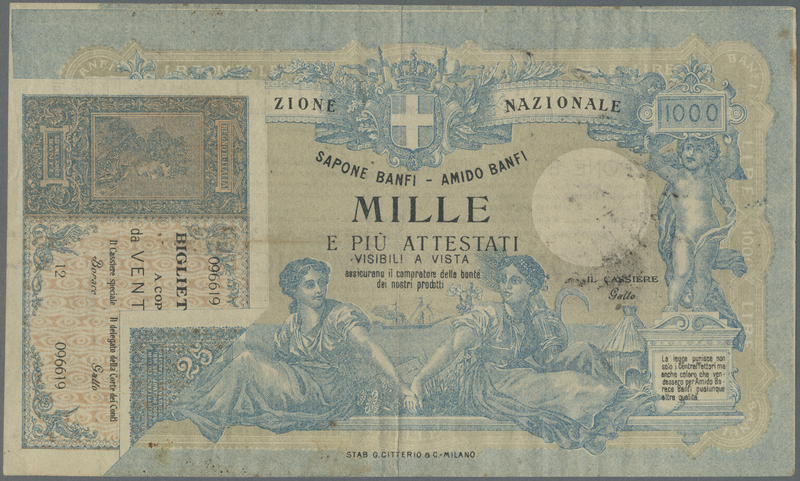 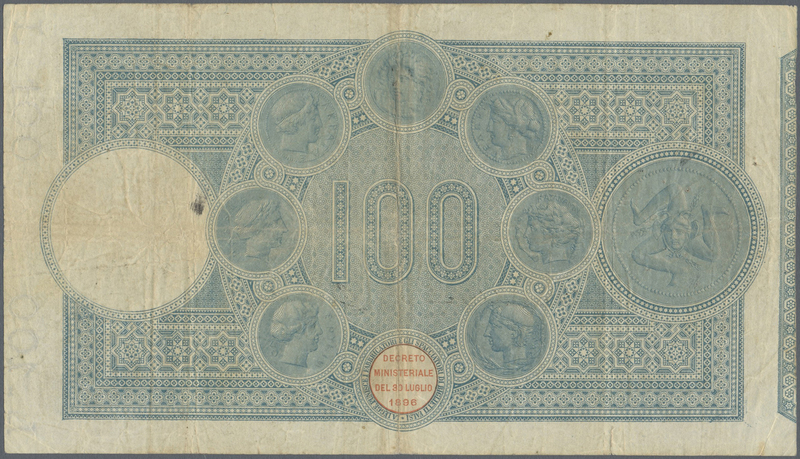 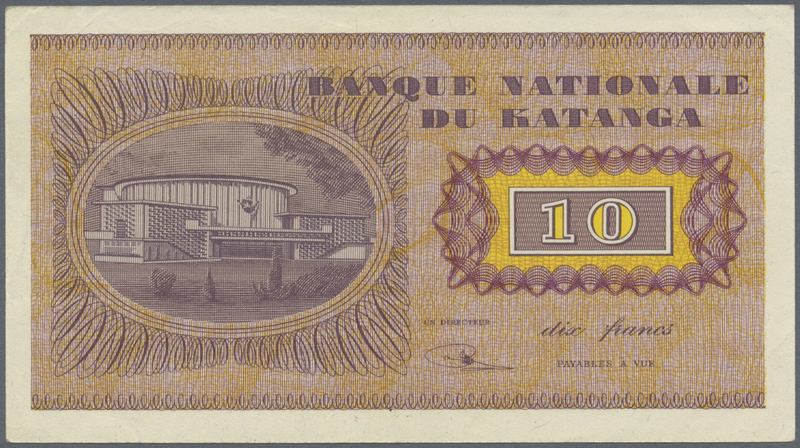 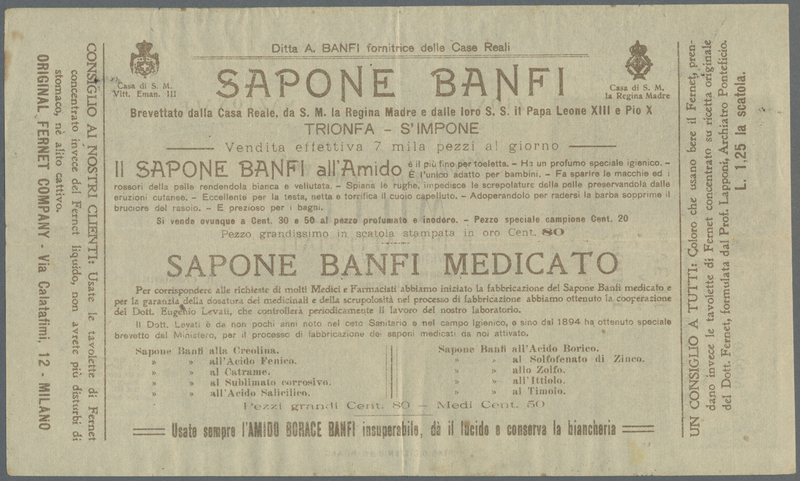 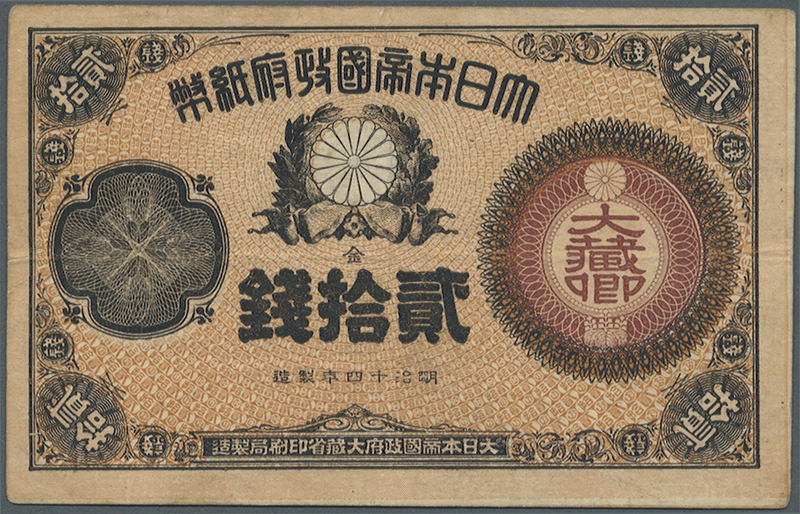 1932 rare contemporary advertising banknote showing 1000 Lire on front as well as a rare issue of 25 Lire, while on back is a lot of text regarding the advertisement for "Sapone Banfi Medicato", very interesting item with only a few folds and light staining, in condition: VF-. 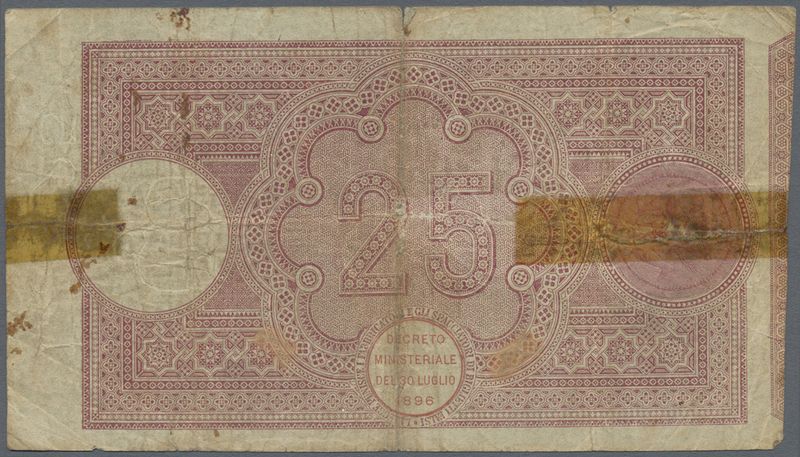 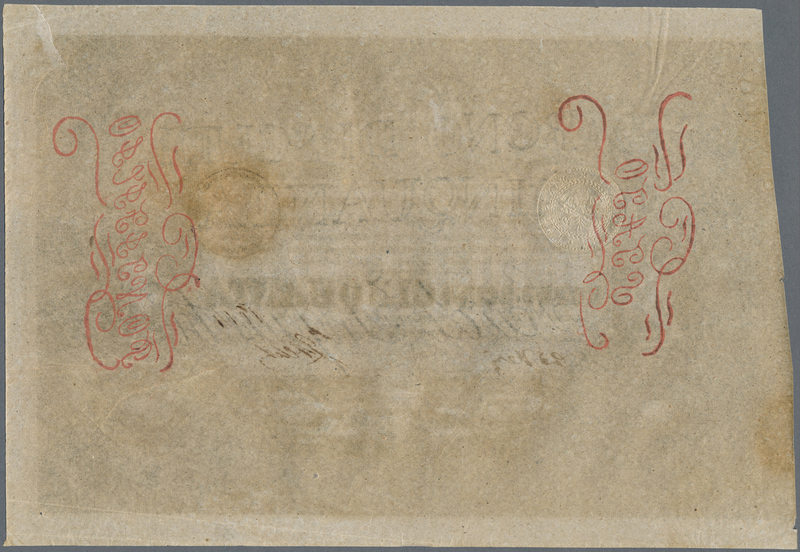 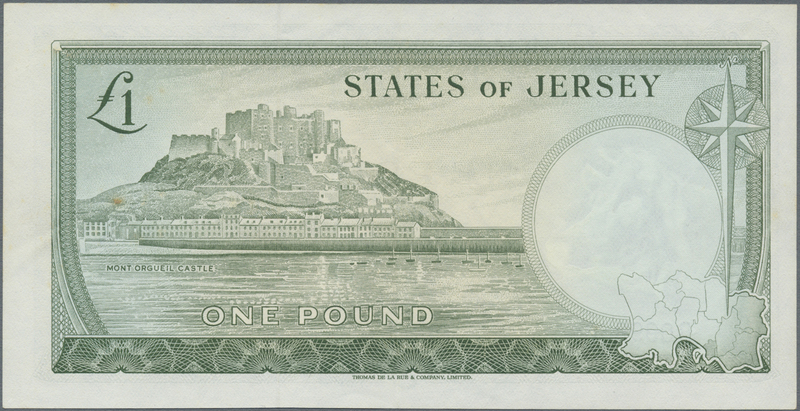 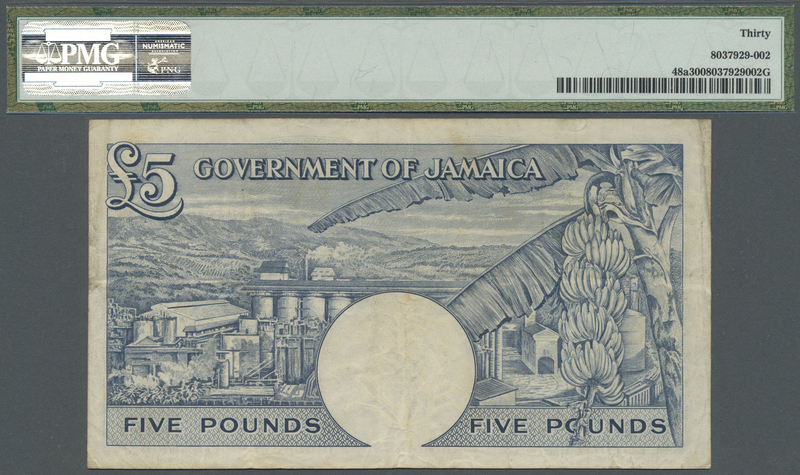 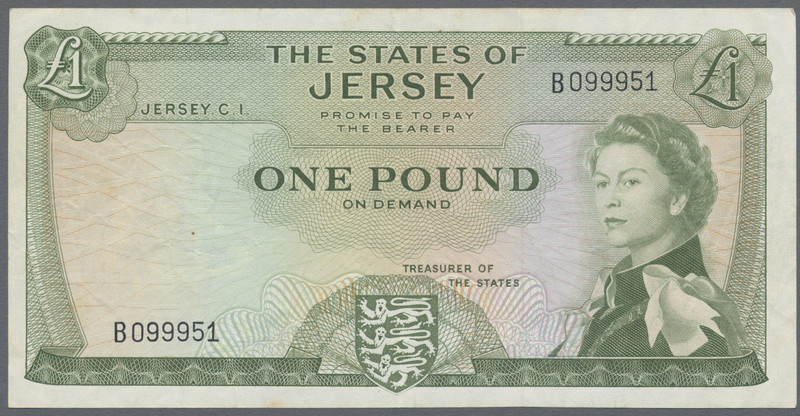 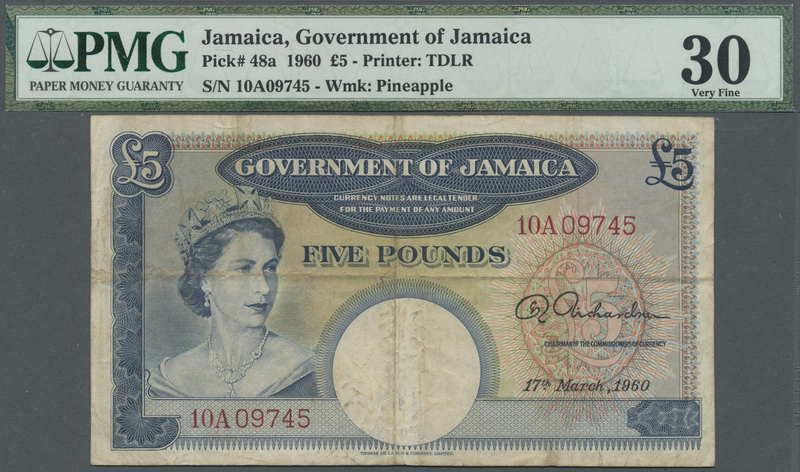 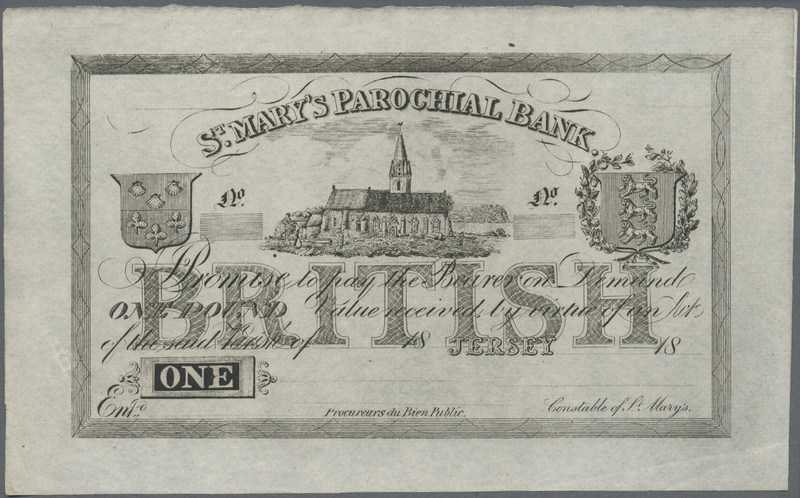 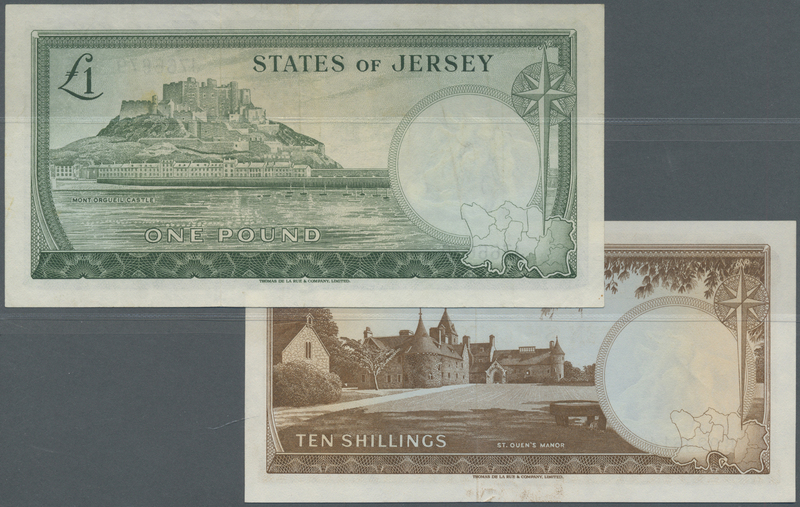 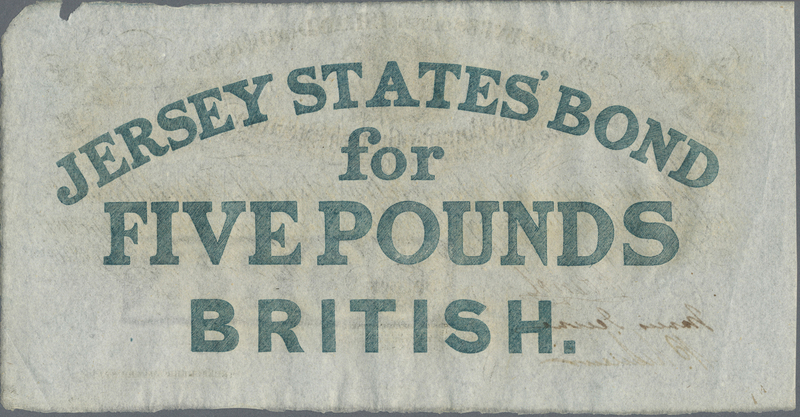 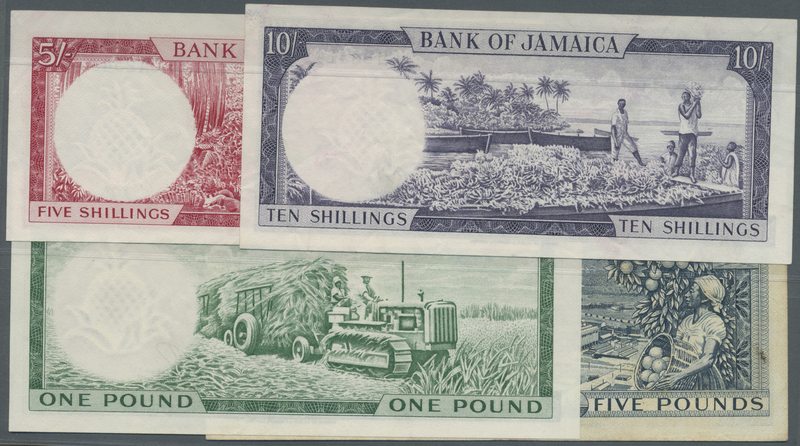 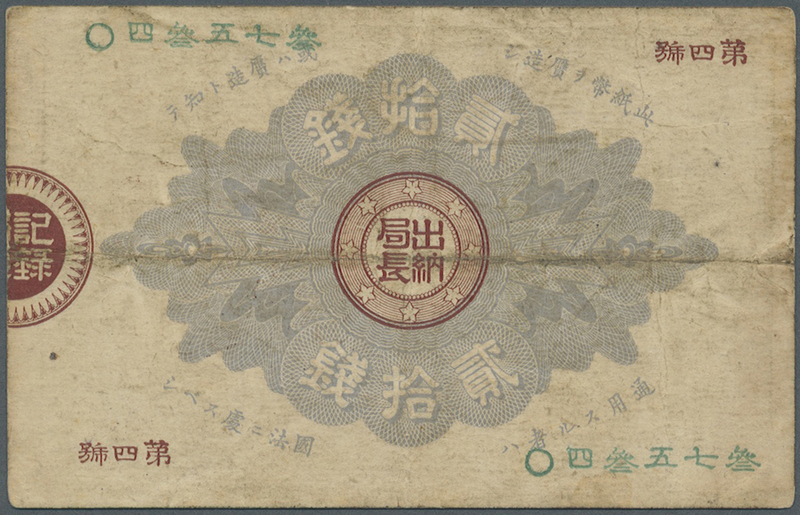 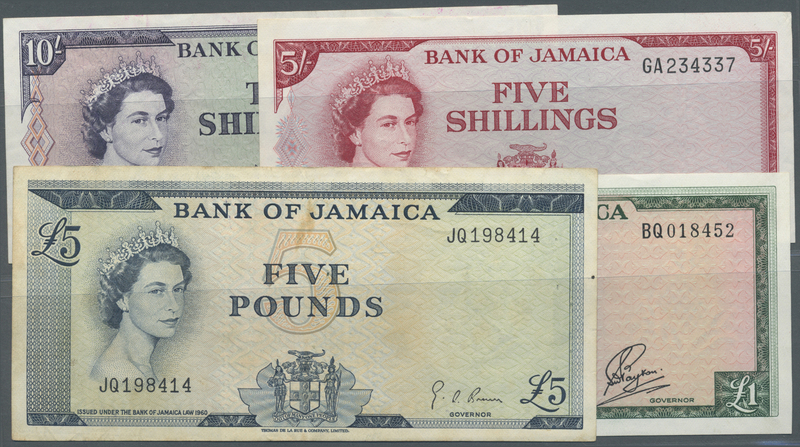 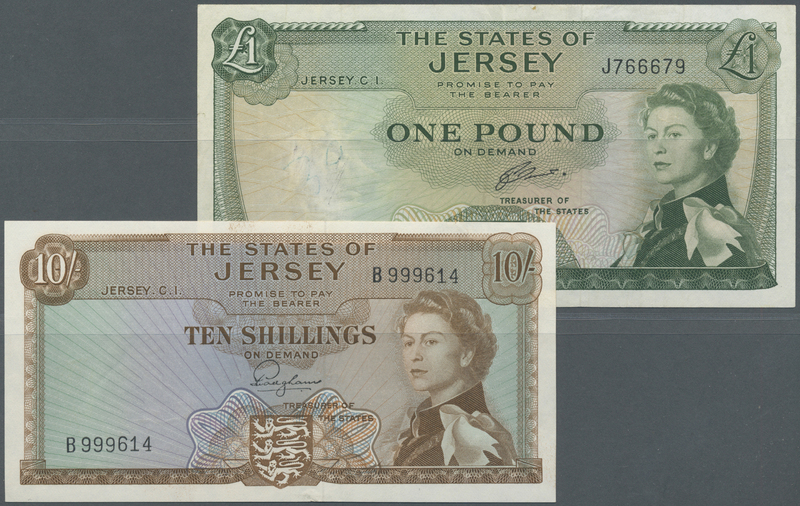 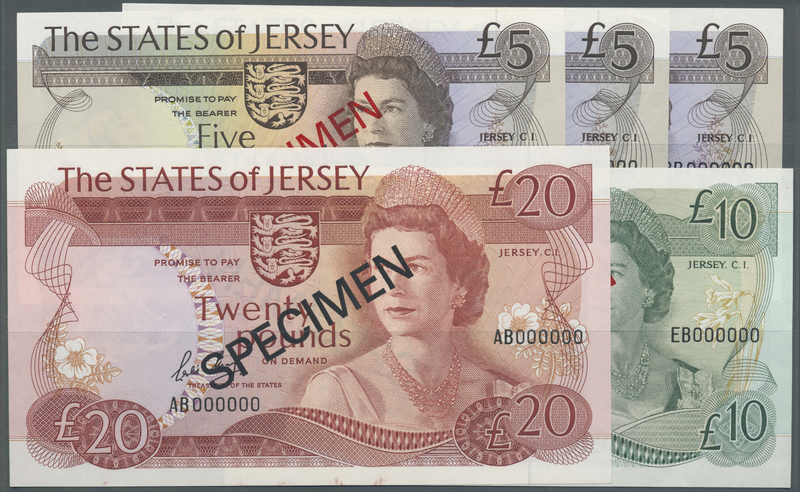 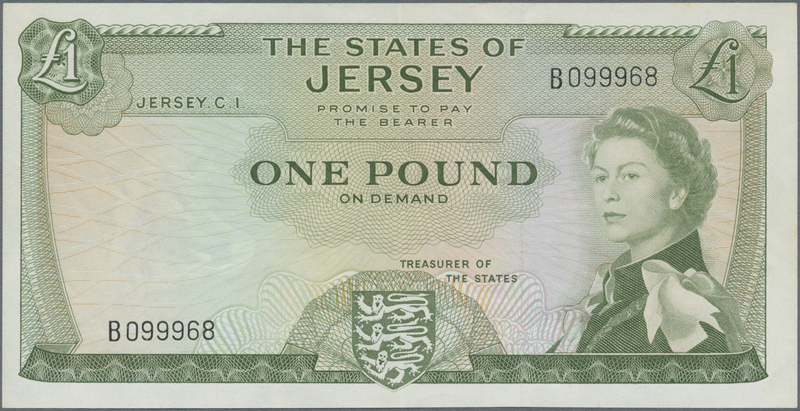 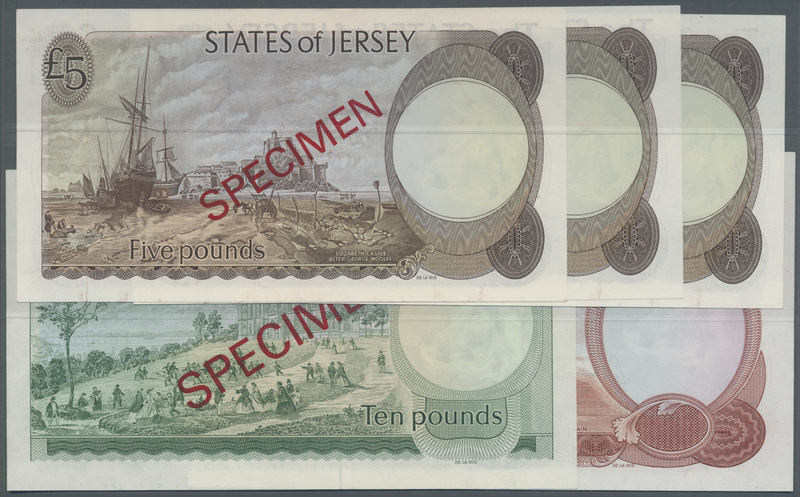 1942 Pick 8c 1 Pound ND P. 8c, center fold and light creases in paper, no holes or tears, still with crispness and original colors, condition: XF. 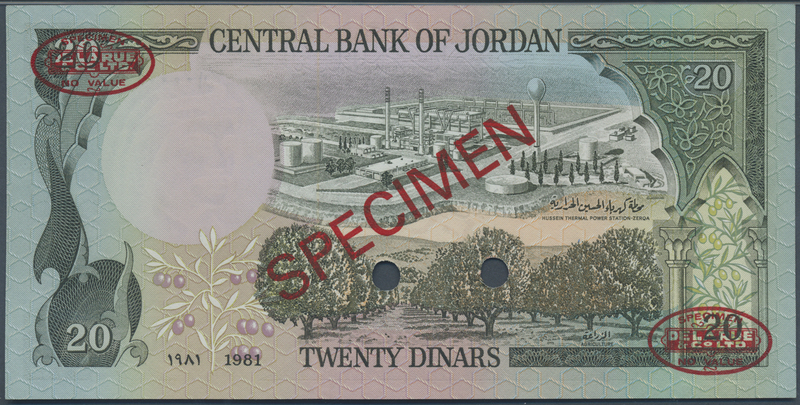 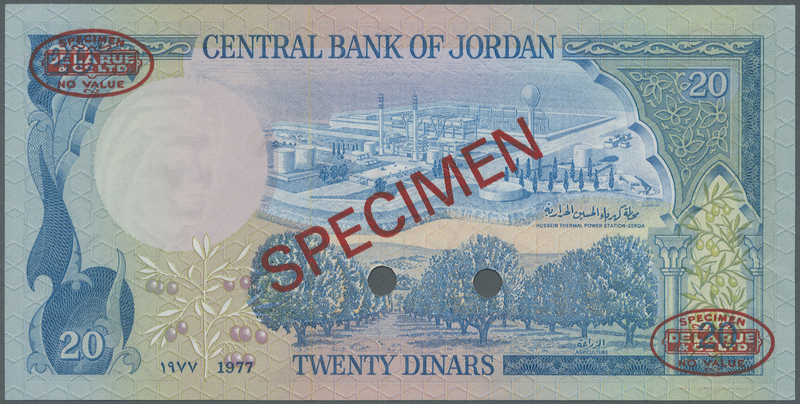 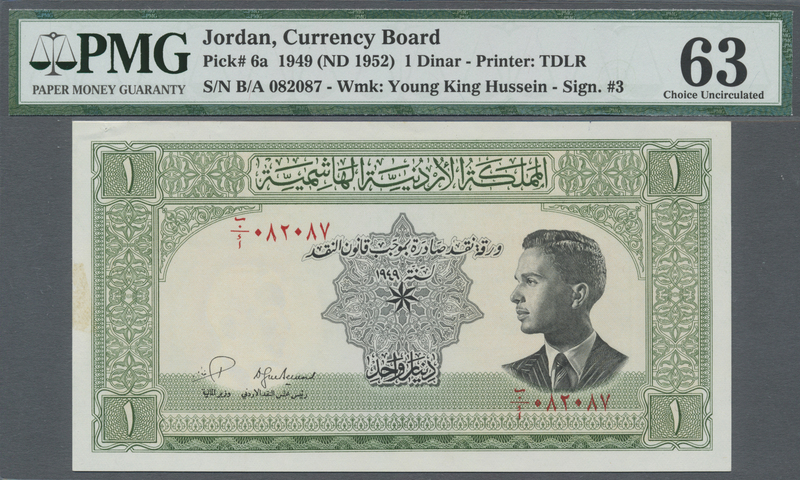 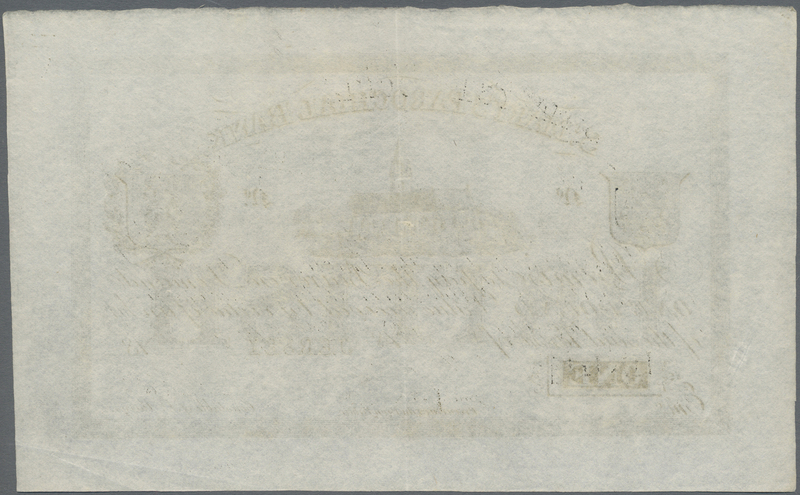 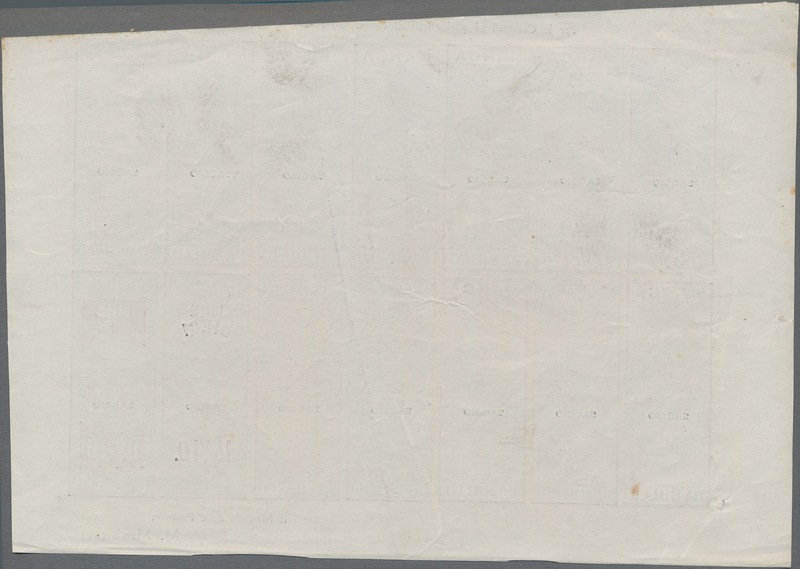 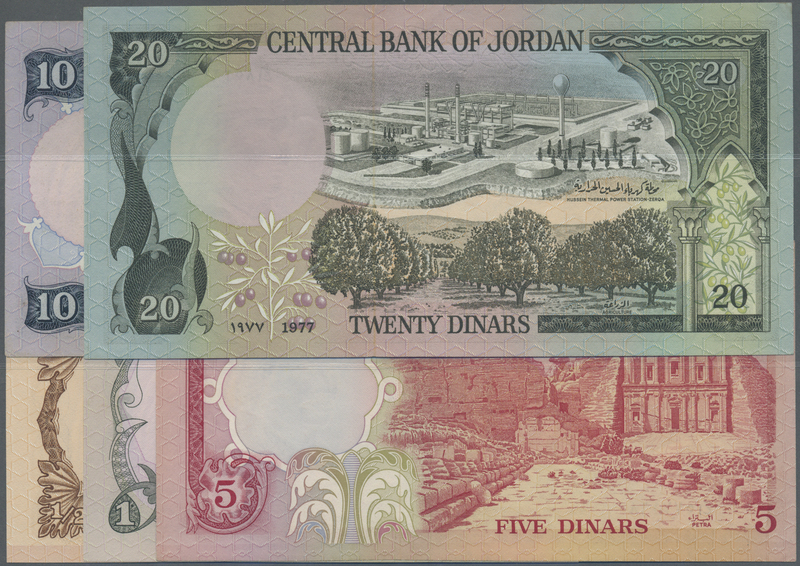 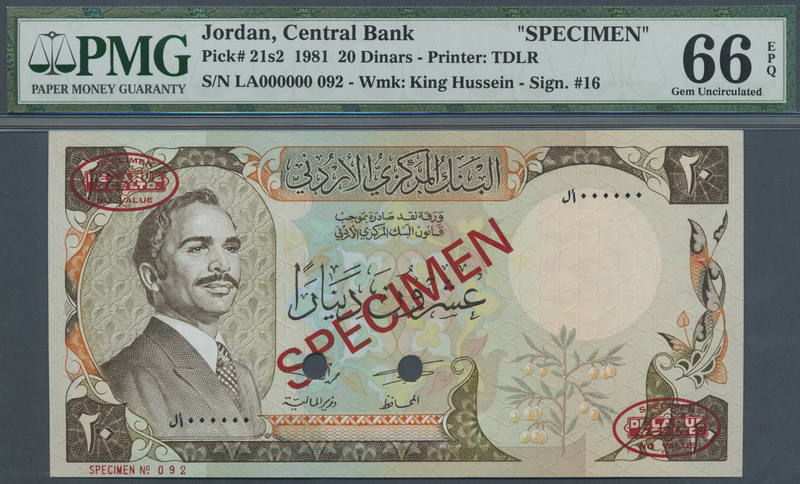 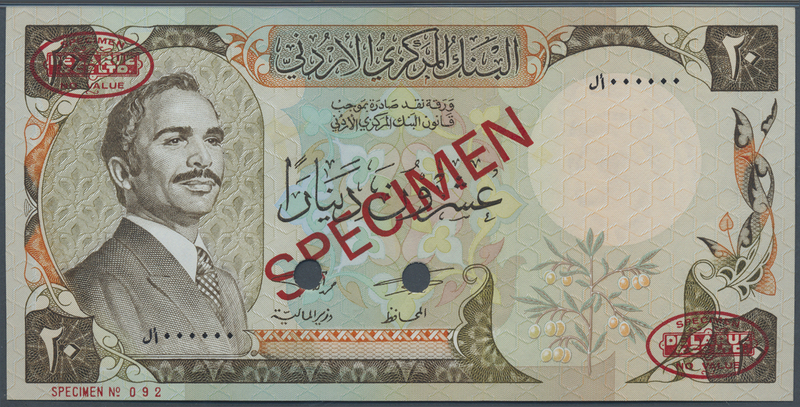 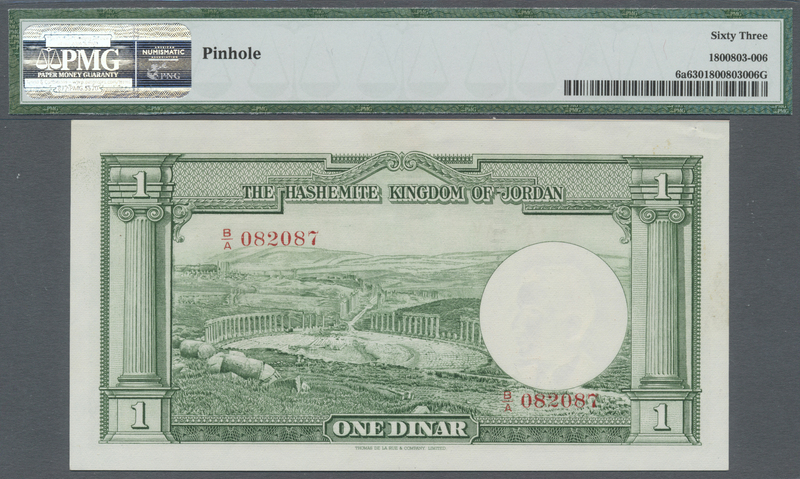 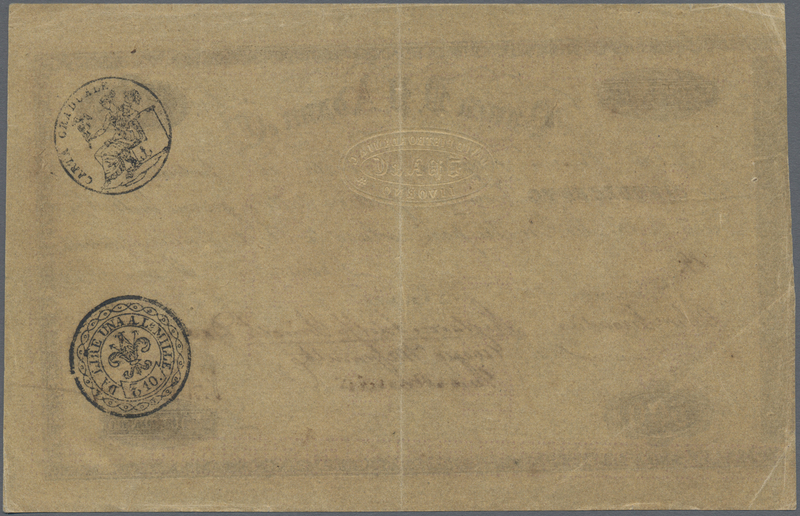 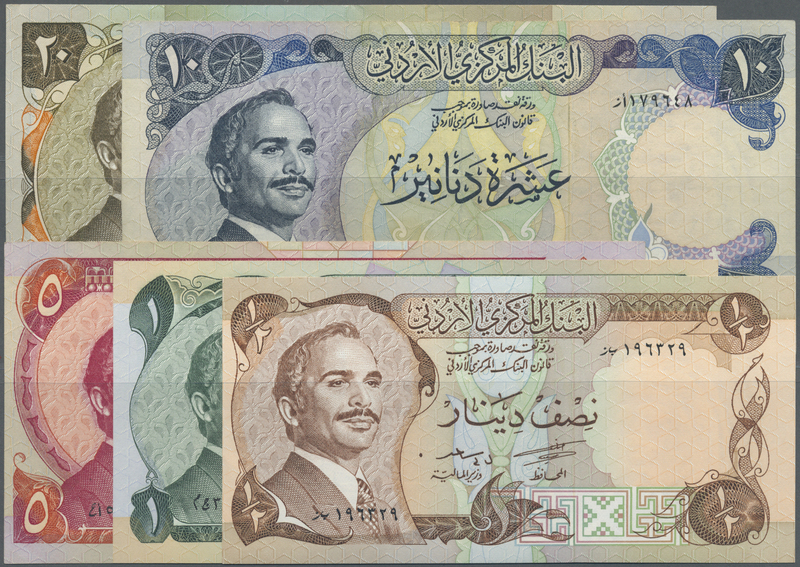 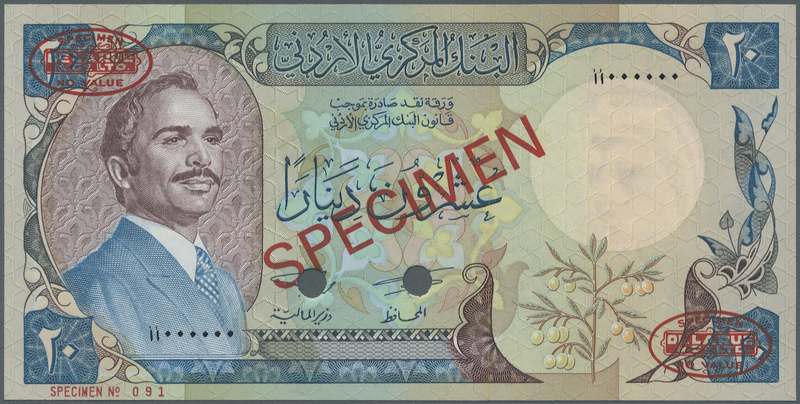 1945 Pick 6a 1 Dinar ND(1952) P. 6a, Sign. 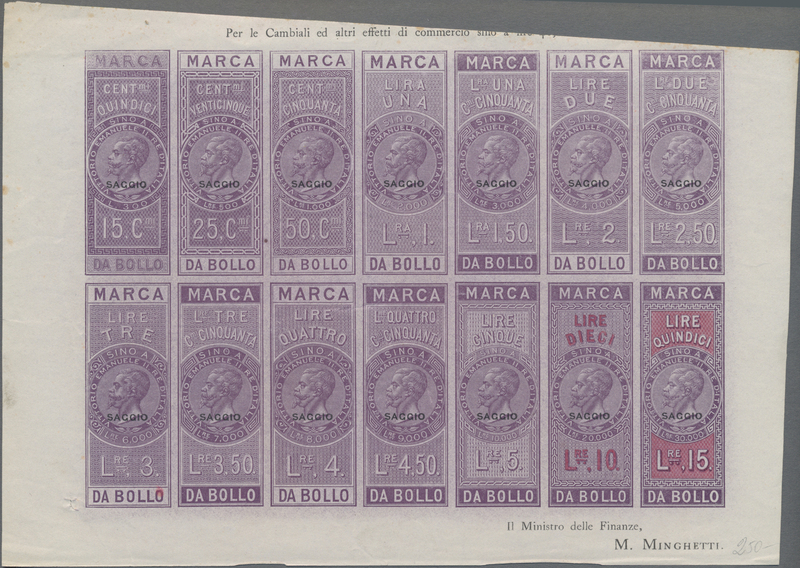 3 in condition: PMG graded 63 Choice UNC.